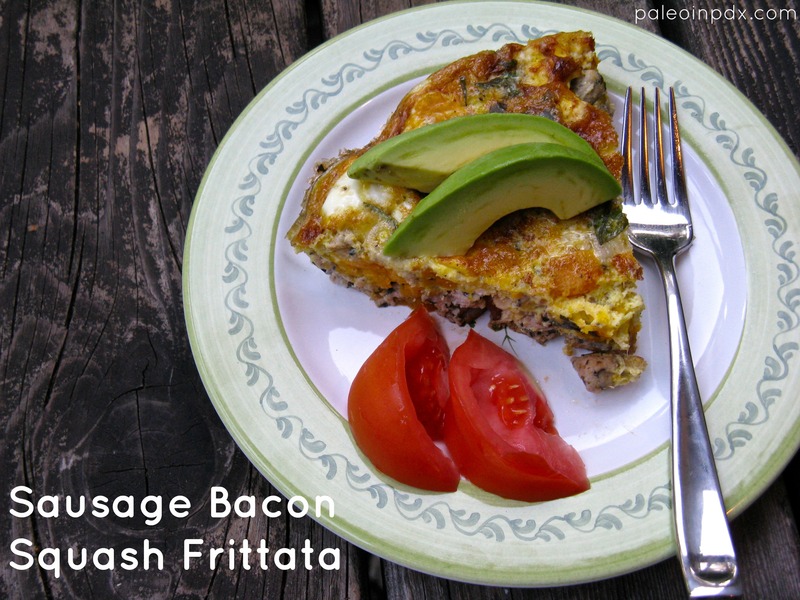 A sausage bacon squash frittata? Yes, I did. Eggs are already amazing as it is and one of my favorite foods, but this combo really takes the cake. Despite my love for this perfect food, I never really eat eggs for dinner — only breakfast. 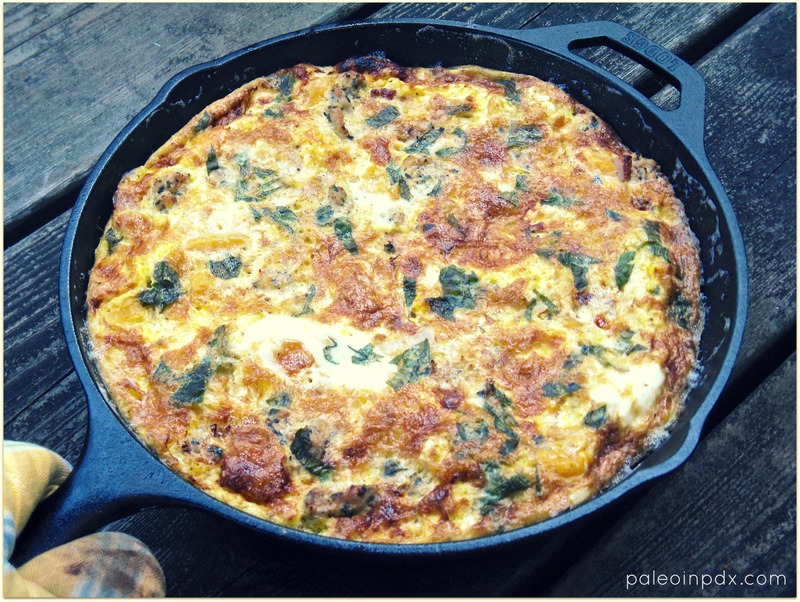 Occasionally, I’ll make a scramble for dinner or maybe my chicken curry egg bake, but never a frittata. This is mainly because I never had a good oven-proof skillet that wouldn’t end of sticking like crazy before. Luckily, I now have a handy cast iron skillet that I absolutely love. The really wonderful thing about it is that it’s virtually invincible and will outlive me. I love that. Why did I wait so long to get a cast iron skillet? Anyway, I’ve been cooking with my cast iron skillet religiously since getting it, but this was my first frittata I made in it. The pan did not disappoint (no sticking!) and neither did the frittata. Add chopped bacon to a medium-sized oven-proof skillet over medium heat. Saute a few minutes, until bacon is cooked through. Then, add the yellow onion. Continue to saute a couple minutes. Then, add the chicken sausage and break up the meat with a spatula. While meat is cooking, whisk together the melted butter, eggs, sea salt and pepper. Set aside. Then, add the frozen butternut squash to the meat mixture and stir. Once sausage is cooked through and squash has softened a bit, pour the egg mixture evenly over the top. Top with the chopped basil and continue to cook over medium-low heat uncovered for 4-5 minutes. Remove skillet from stove top and place under the broiler for 4-6 more minutes or until eggs are cooked through. Slice and serve with avocado and tomato slices. Yay for cast iron! And for frittatas! This look super. Your photograph is also really lovely. Agreed! Thanks for the nice compliments too! Thanks, Naz! And no worries, I miss posts all the time…even more so lately too!